Digital radiography (digital x-ray) is the latest technology used to take dental x-rays during your dental visit. This technique uses an electronic sensor that captures and stores the digital image on a computer. This image can be instantly viewed and enlarged helping us detect any potential problems. Dental x-rays are an essential part of preventive oral health. They act as a diagnostic tool that provides valuable information not visible to the eye. This tool is essential for detecting any hidden abnormalities. Without x-rays, it’s possible that a problem could go undetected until it’s severe enough to cause physical discomfort. Treatment of dental conditions is often much easier if they’re caught in their early stages. 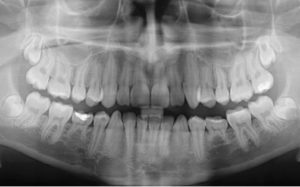 X-rays can detect a wide variety of conditions like decay (cavities), bone loss, poor tooth or root positions, problems inside a tooth or below the gum line as well as more serious conditions such as tumors. Dental x-rays are part of a thorough preventive dental plan and can help find many issues before they become serious.